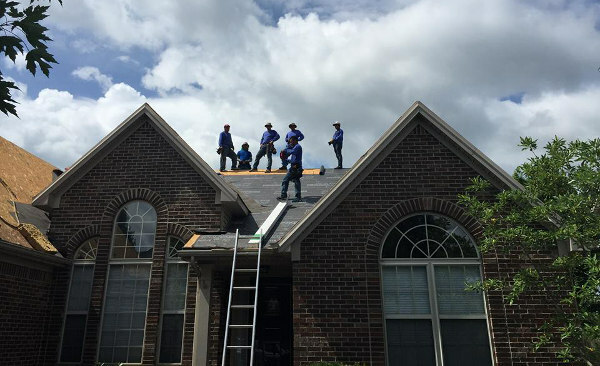 You can expect the best possible service when you choose us as your roofing contractor in Nicholasville, KY.
We pride ourselves on delivering a quality customer experience backed by reliable and expert installations. Providing residents of Jessamine County with quality workmanship that they deserve! Thanks for a great job! I will recommend you to anyone who might be in need of your services. We offer additional services including siding replacement, gutter repair, window installs and other remodeling services for your home. As a roofer in Nicholasville, KY we offer many types of services. Our technicians are trained and experienced to take on any project. The following are a list of roofing services we provide. This is a repair to a roof we did in Nicholasville. Our team of roofing technicians can efficiently repair any need you have with your roof. If you’re noticing water spots on your ceiling, an uneven appearance or warping of shingles, we can provide you with a quality roofing repair. We offer new roof installations. If you’re building a new home, want to change the look of your roof or it’s been years since you have replaced your shingles, we can help! We provide new roof installations backed by the best products, materials and warranties on the market. Ready to see what we can offer? Emergency roof tarping to prevent water from causing additional damages. Accidents and unforeseen incidents can occur at any time. 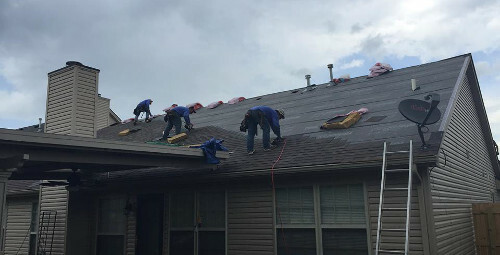 To prevent your home from additional damages we provide emergency roof tarping services to temporarily prevent water and mother nature from causing additional damages. 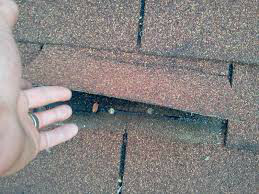 This is an image of shingles needing to be repaired. Some jobs we take on are just a simple fix. Whether it’s from a poor installation, deterioration, or mother nature, we offer shingle repair to get your roof back into shape. One of the latest trends in our industry is metal roofing. There are advantages and disadvantages with this type of application, but it simply comes down to a matter of choice. Contact us to discuss your roofing options. We offer roof inspections in Nicholasville, KY. Whether it’s for a real estate transaction, an annual check up or you need an inspection after a storm, we offer detailed roof inspections in Nicholasville. This is an image of hail that caused damage to a roof. Kentucky is known for damaging storms such as high winds and hail. These storms can cause severe damage to your roofing components. 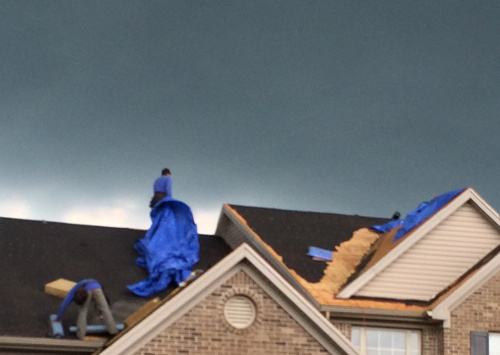 We offer insurance storm damage replacement services for all your roofing needs. We like to believe that the experience you’ll have with us is what sets us apart from other roofing companies. From our initial introduction to the final product installation, our goal is to have you wanting to rave positively about us like our previous clients have done. You’ll experience every component of our operations. Our staff is dedicated to quality assurance and your satisfaction. To begin our process you will meet directly with our Senior Sales Consultant. Their role is to assist you by determining what your roofing needs are and offer unbiased constructive advice for the best outcome. During the procedure of your repair or installation, we offer a quality control concierge who stops in to oversee that all aspects of your project are efficiently and properly completed. Their role is also to answer any and all questions you may have. Our owner, Brad Pagel is always involved with each job. Brad’s commitment to your satisfaction is one major difference that sets a higher standard of expectations in our industry. 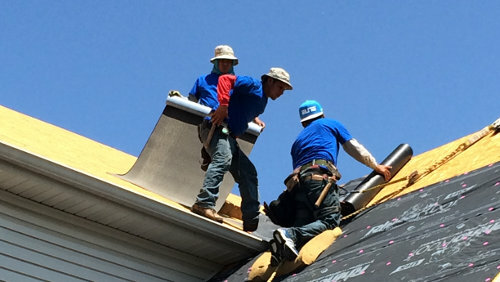 Constantly hard at work from start to finish is our roofing crew. They are trained and educated in the latest installation techniques to provide a quality installation. With respect to your property and home, we can confidently say we have the best workers in the industry! Contact us for a different experience! Occasionally we get the opportunity to receive detailed feedback from our clients. We value and truly appreciate what our clients have to say and how they feel about us. The following is an Q & A interview we conducted with a recent client. Q: What was your reason for contacting us? A: I noticed that my ceiling had water spots and it was starting to get worse so I thought I might have a leak in my roof. Q: What was your first point of contact with us? A: I called your office number and was treated very professionally by your secretary. 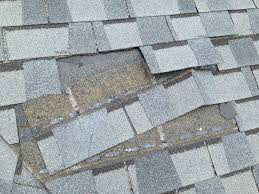 From there I met with Keith who was very professional and kindly educated me on what might be wrong with my roof. Q: Why did you choose our services? 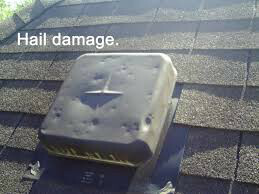 A: After Keith showed me pictures of my roof that had hail damage I wasn’t for sure what to do. Keith then told me that your company offers insurance claim repair and that your company has helped other homeowners with the same circumstances. I then researched your company even more by checking the BBB and saw that you had nothing but positive reviews, so I felt comfortable with selecting your services. Q: What was your overall experience with our company? A: I was very pleased and surprised to actually get what I was promised. Q: Would you recommend us to your family and friends? A: Yes, I’ve already let one of my neighbors know about your services. This company was pleasantly surprising. They treated me with respect and fulfilled every one of their promises. I got my roof replaced in one day and can’t say enough about their professionalism. If you’re looking for an outstanding roofing company these guys are great to work with! We take great pride in delivering our services with expert and precise installations. To back that up we offer a variety of roofing warranties that cover our products, materials as well as our labor. Depending on what type of shingle you select, the materials we install from Owens Corning come with a manufacture’s warranty of 30-50 years. With all of our projects we provide a 5 year warranty on our labor. This is confidently offered because we are committed to quality workmanship! With an A+ BBB rating and our commitment to your satisfaction, you’ll see why others feel we are the best roofing company in Nicholasville. We stand behind the quality of our work and treat your home with the respect it deserves. We strive to create a relationship with you that will have you recommending us to anyone who needs our services. Contact us for your next roofing repair or installation.